These pictures might not shock people in New York, but they kind of blew my mind. 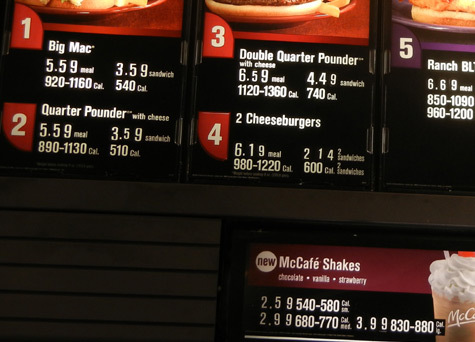 Restaurants in California have begun to post calorie counts for all of their foods and drinks, including fast food restaurants such as McDonalds and KFC. California Senator Padilla's SB 1420 was passed in September of 2008, with parts of the law going into effect over the last two and a half years. At chain restaurants with at least 20 locations, these menu-board displays are required, beginning on January 1 of this year. 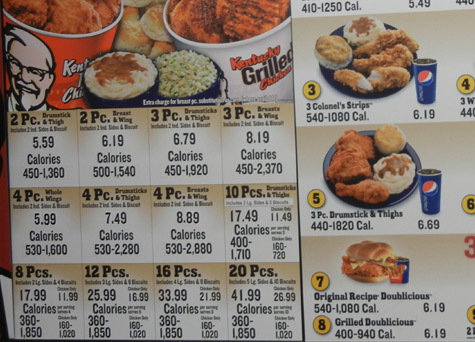 KFC menu: A lot of the items on the menu are combination plates, which is show to contain a range of calories, depending on what side dishes are chosen. The calorie count for some meals go as high as 2,880 calories. The menu highlights the KFC low calorie option at 360 calories, (which is pretty low!) and the photo features the first Diet Pepsi I've ever seen on a menu board. Click the photos for larger view. Subway menu: Subway markets their sandwiches as healthy food, so I figured they would have their calories prominently featured. They did. 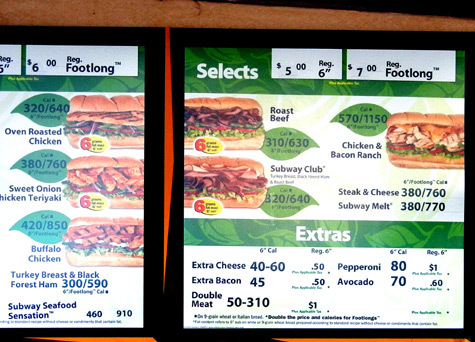 In some cases the font used for calorie counts was larger than that used for the prices. Curiously the calories for six-inch subs weren't always exactly half of the 12" subs. Did you know that adding avocado gives you more calories than adding extra bacon? 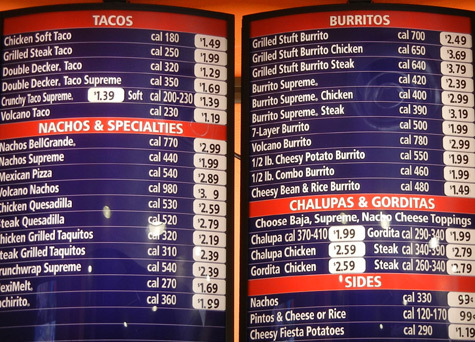 Taco Bell menu: The menu at Taco Bell was made up of single a la carte items, so the calorie counts are all under 1,000. The highest calorie single item was a salad, the Chicken Ranch Taco Salad, at 910 calories. 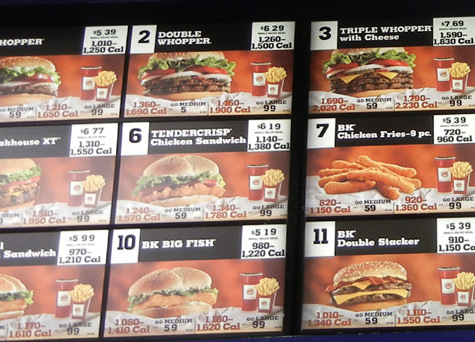 Burger King menu: Burger King skipped the sandwich price and calories completely, cramming prices and calorie info for a small, medium and large meal onto each featured item. Almost everything on there was more than 1,000 calories.